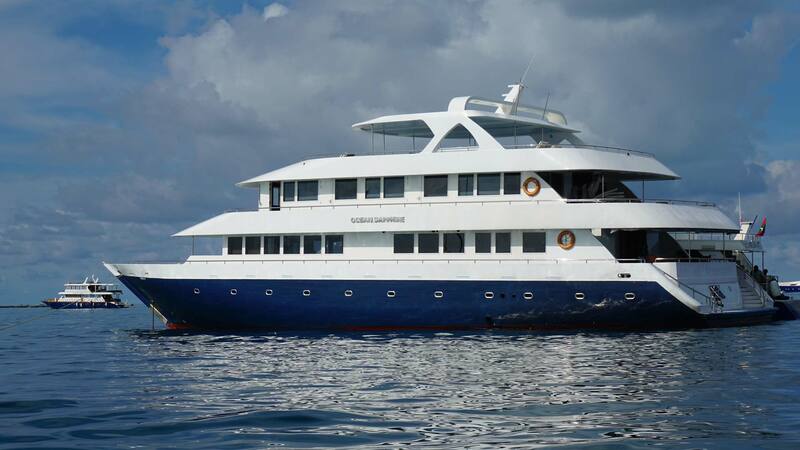 Luxury Maldives charter yacht OCEAN SAPPHIRE was launched in 2012 and measures 35m (114ft). 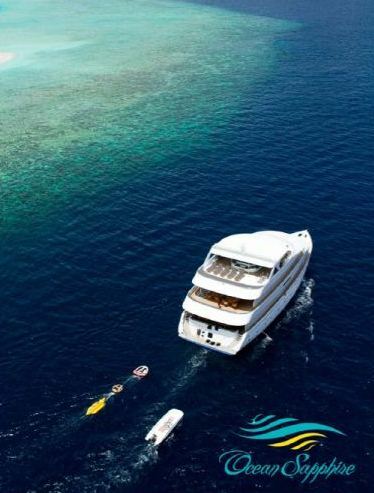 M/Y OCEAN SAPPHIRE offers customized charters, for up to 24 guests, in 11 en-suite cabins. 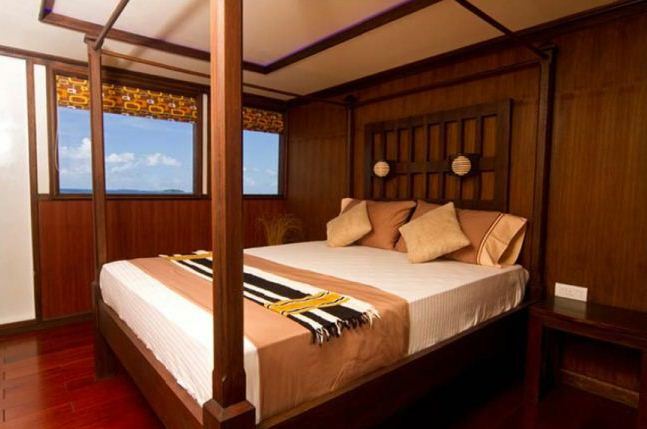 Yacht OCEAN SAPPHIRE has a natural décor featuring teak and pine throughout. 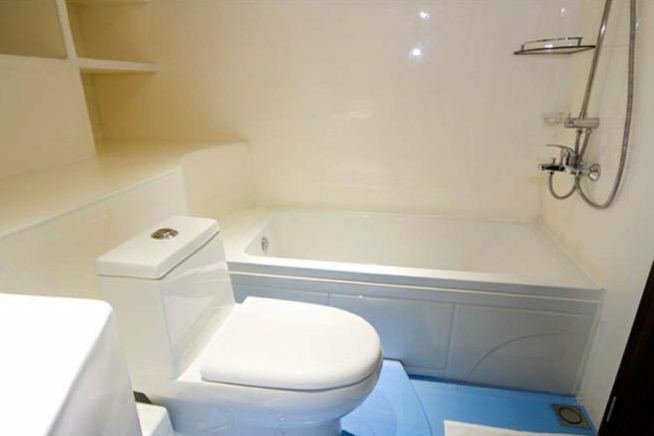 The social areas are generous and the cabins spacious. 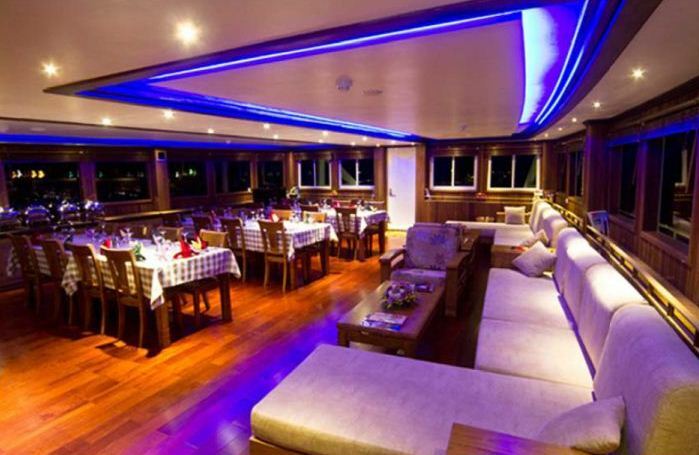 On the main deck, a full service restaurant and lounge is surrounded by panoramic windows, ensuring spectacular views. The restaurant seats 22 guests in a sitting, while the lounge adjacent, offers plush sofas, occasional chairs and coffee tables. 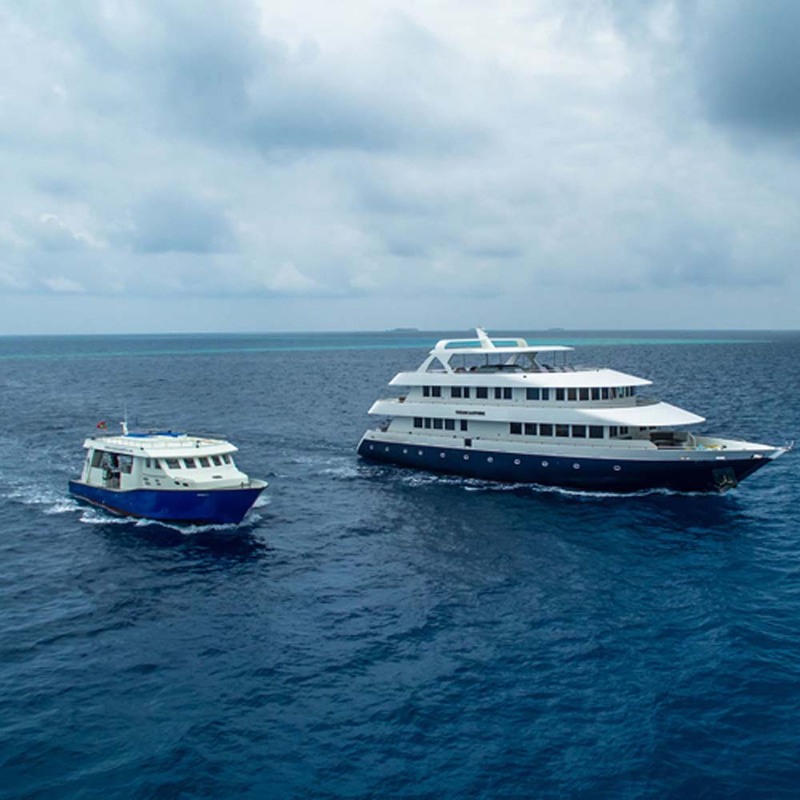 Crewed Maldives charter yacht OCEAN SAPPHIRE has plenty of exterior living areas, on her 3 decks. 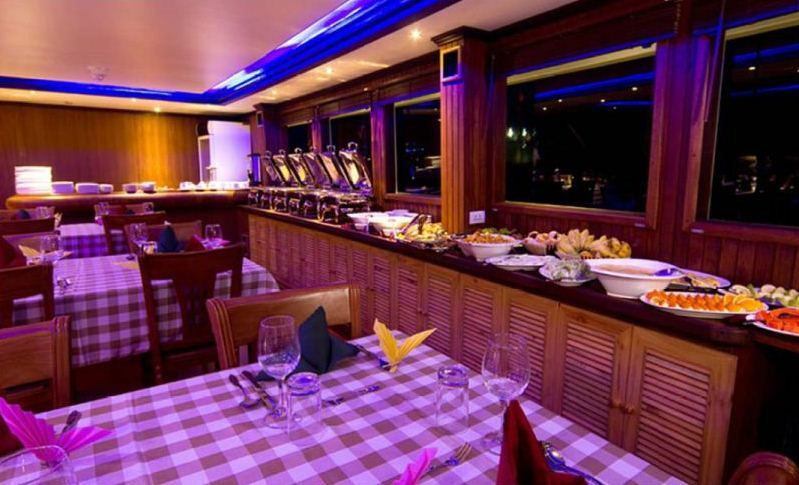 Aft of the restaurant and lounge, is a large shaded deck with ample seating and relaxing space, followed by an extended swim platform, ideal for enjoying the water toys and boarding the Dhoni dive boat. 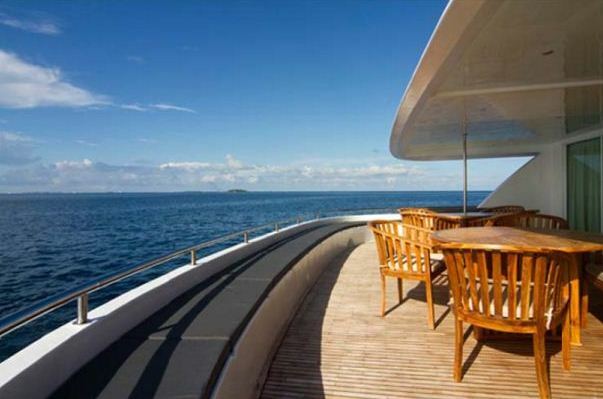 The main deck wraps OCEAN SAPPHIRE leading to a further seating area on the bow. 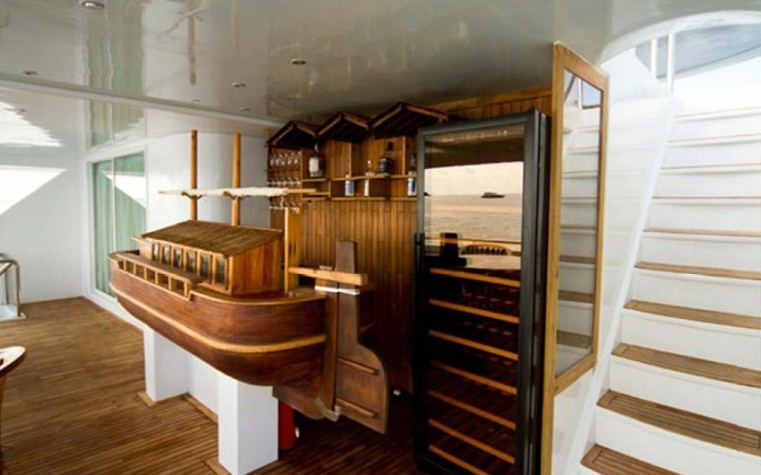 The upper deck boasts teak cocktail tables, seating and a complete wet bar, perfect for that cool sundowner. Steps lead up from the upper deck, onto the massive sundeck, where guests can choose from ample chaise lounges, teak deck space and a deluxe Spa Pool tub. 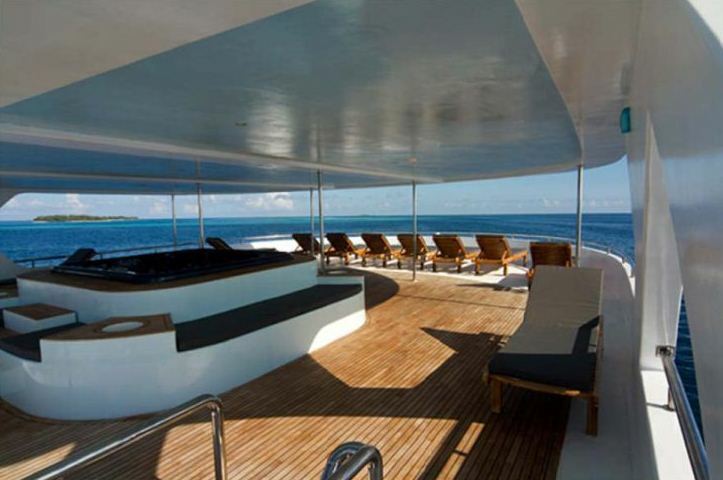 M/Y OCEAN SAPPHIRE has a beam of 10m (32.8ft) and a draft of 1.5m (5ft). 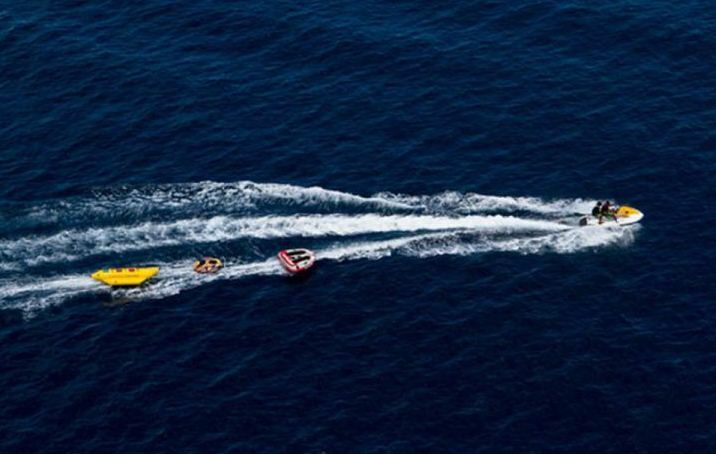 The yacht is powered by 2 x Daewoo 480 HP engines, capable of 10-13 knots. 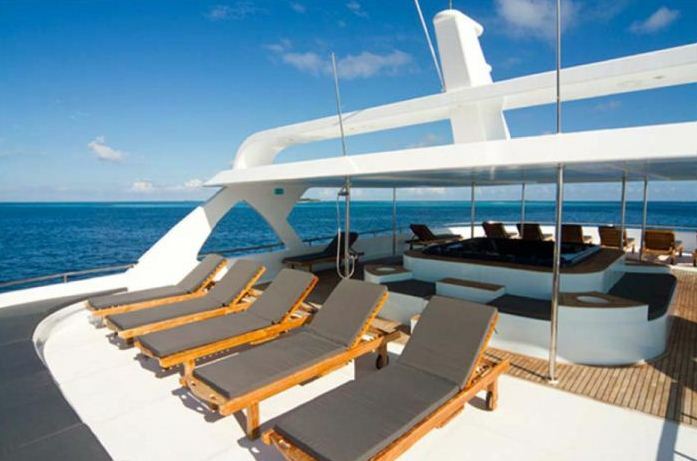 Accommodation is on 2 decks aboard the OCEAN SAPPHIRE motor yacht. 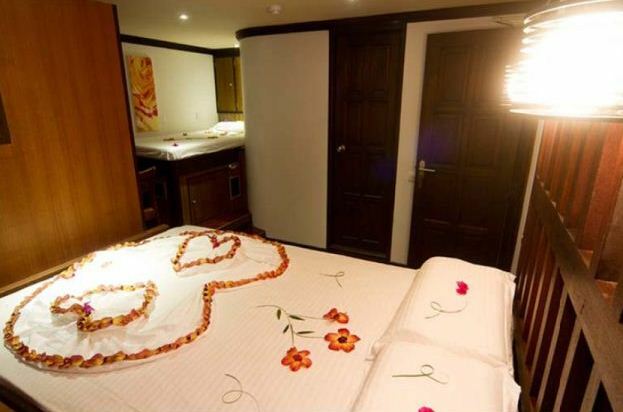 Below decks are 6 twin cabins, each with en-suite facilities with showers. 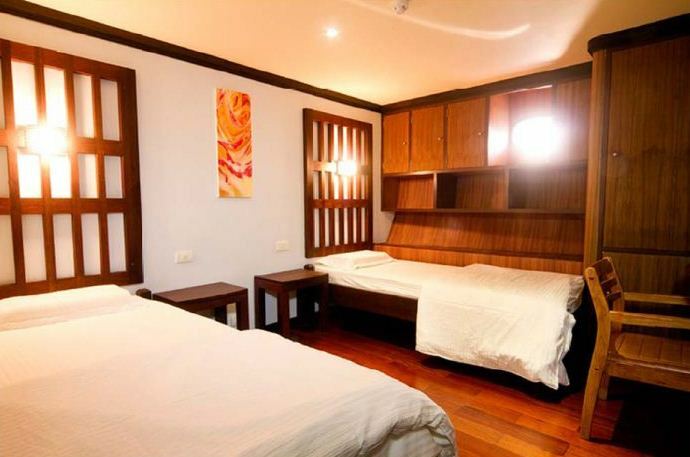 All twin cabins can convert into doubles when requested. 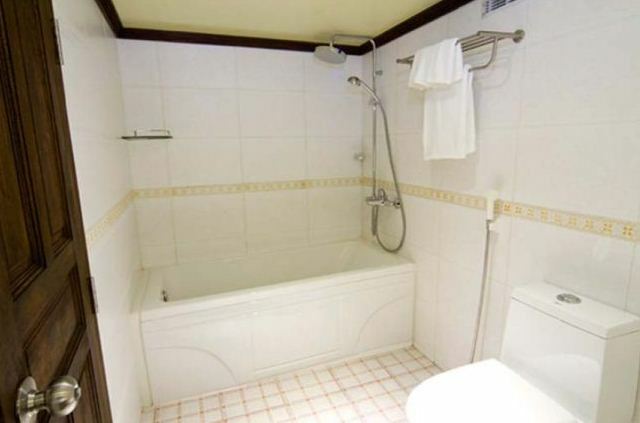 A further family cabin boasts a king size bed and single bed, with en-suite facilities and tub. 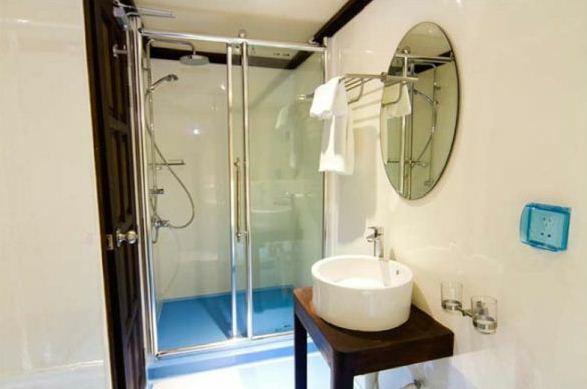 On the upper deck, above the restaurant, are 4 double cabins, each with en-suite facilities with tub. 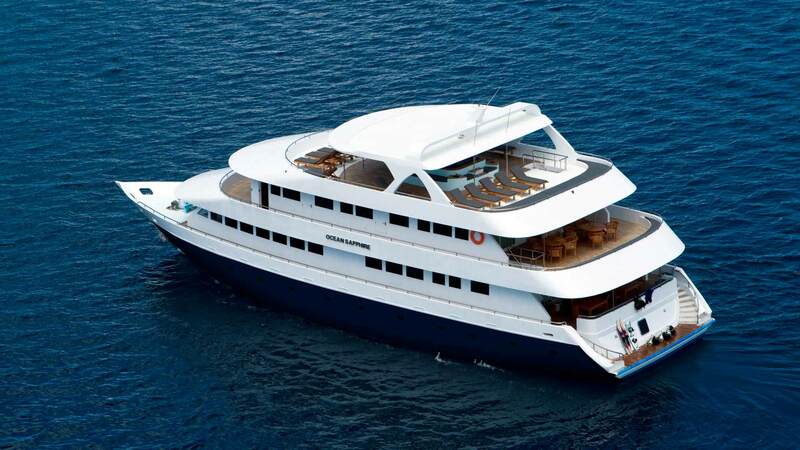 All cabins are fully air conditioned. 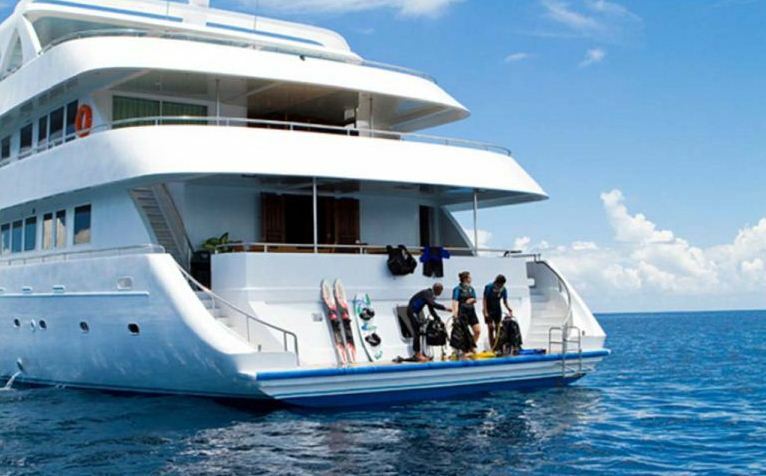 The OCEAN SAPPHIRE yacht has a Spa and Diving equipment plus water sport toys can be arranged at an extra cost prior to your charter on OCEAN SAPPHIRE.